This morning, as we were lazing in bed, S started daydreaming aloud about “American breakfasts”. She quickly clarified that she didn’t mean a New Yorker’s breakfast, i.e. bagels and cream cheese, donuts and coffee, etc. She was talking about things that you didn’t buy rushing from the subway station to the office, but things you cooked for your family, things that when served up “hot off the pan” put smiles on faces, simple yummy staples like bacon and eggs and blueberry pancakes. To make her happy–and also because once she mentioned it, I started craving it also–I decided to whip up some blueberry pancakes. To make S even happier, I looked for the healthiest pancake recipe I could find. Enter Bill Granger and his wonderful book, bills food. On page 30 of this Sydneysider celeb’s book, I found a wonderful, easy recipe for Wholemeal Pikelets with Butter, Lemon and Sugar. All I had to do was follow the pikelet recipe, leaving out the butter, lemon and sugar topping and replace that with some delicious blueberry compote that S had made a couple days earlier. It took only a few minutes to prep the batter and another few to make the pikelets and serve them. I’m happy to report that S was beaming, not only because of how good these tasted but also because we had found a great way to use our wholemeal flour to make a relatively healthy (yet still yummy) breakfast. Sift the flour and baking powder into a bowl. Add the sugar and stir. Add the egg and milk and whisk until smooth. Heat a large, non-stick pan over medium heat and brush with butter. Spoon tablespoons of the batter into the pan. Cook each for 1-2 minutes or until bubbles appear on the surface. Then flip and cook for another 30 seconds. Mix 1 cup of the berries with the sugar and cook over low heat until the berries have popped and broken down, about 5 minutes. Strain the cooked berries into a bowl and discard the solids. Add the remaining berries and toss to combine. Hi Chubby Hubby, I love how you can make even the most simple things look so elegant. 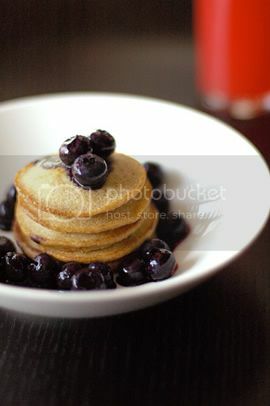 S. is certainly lucky – when I wake up craving something nice for breakfast I have to make it myself! How do you get your pancakes to be so cute and small? Healthy and delicious. I love the topping of blueberry compote. I’ll have to try it soon. Melissa: Thanks. Sometimes the simplest things are the best. I have to admit that most of the time S is making me wonderful edible treats, so when I can make something for her, I usually jump at the chance. tscd: I estimate 1 tablespoon per pikelet. I also use a really large pan. I can cook 5 in the pan at one time. nic: Thanks. The Claudia Fleming book is fantastic. How lovely and perfect. I love the size and dainty quality of pikelets. I have this silly obsession with perfect little tiny plates (to be the subject of a later post, I'm sure) – and these are the perfect example of my neurosis! The blueberry compote sets them off perfectly. the last thing i would ever do is insult your wonderful creations, but i’m glad you see that your version of bill granger’s pikelets turned out as firm and as “dry” as mine. not to say that they *are* dry, but compared to the photo in the book, they do not seem to be the same food item. granger’s seem all flooby, and these are hardly flooby.